President Donald Trump compared an unnamed London hospital to a "war zone" on Friday, saying despite tough gun laws in the UK, it has blood all over the floors from victims of knife attacks. 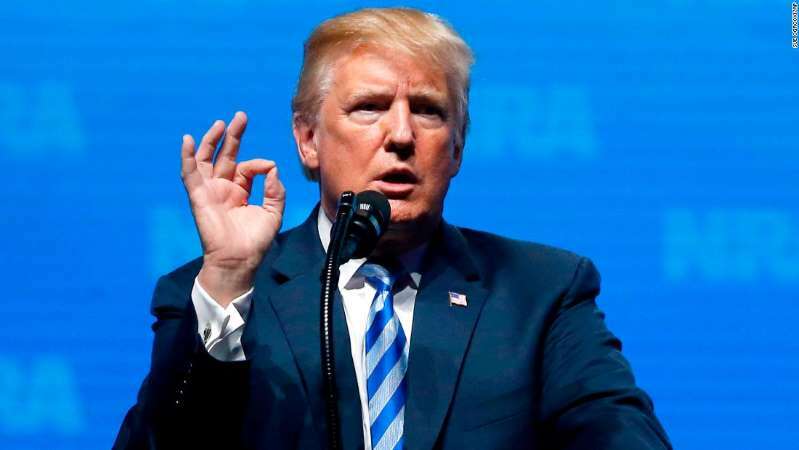 Trump made the comments -- an apparent defense of gun ownership -- while addressing the National Rifle Association convention in Dallas. "They don't have guns. They have knives and instead there's blood all over the floors of this hospital," Trump said. "They say it's as bad as a military war zone hospital ... knives, knives, knives. London hasn't been used to that. They're getting used to that. It's pretty tough." It's unclear what hospital Trump was referring to. But the BBC reported that a trauma surgeon at the Royal London Hospital recently told the network that his fellow doctors have compared it to an Afghan war zone. "Some of my military colleagues have described their practice here as being similar to being at [Helmand province's former Camp] Bastion," Dr. Martin Griffiths told the BBC. "We routinely have children under our care, 13, 14, 15 years old are daily occurrences, knife and gun wounds." British media outlets cited his quotes in stories published last month. During the speech, Trump also took aim at Chicago, saying it has tough gun laws but a problem with gun violence. "We all know what's going on in Chicago but Chicago has the toughest gun laws -- they're so tough, but you know what's happening." Using the same argument, he asked whether the vans, trucks and cars used in terror attacks should be banned. Trump has a history of criticizing London, and has had several well-documented spats with its mayor, Sadiq Khan. In June last year, he slammed Khan in a tweet shortly after a terror attack in London. At the time, Khan said he has more important things to do than respond to Trump's "ill-informed tweet," which he described as out-of-context. A few months later, in November, Khan slammed Trump for retweeting anti-Muslim propaganda from a British far-right group and suggested British Prime Minister Theresa May shouldn't welcome Trump for a state visit. The President is expected to visit the United Kingdom in July, according to two people familiar with the matter. The trip would conclude months of back-and-forth over when he'll visit America's closest ally. Trump also attacked the UK's National Health Service in February, claiming it is "going broke and not working." He accused Democrats of pushing a similar universal health care system for the United States. The President has also criticized the new location of the US Embassy in London, which moved from its long-standing site in central London to its new home south of the city in January. "We had the best site in all of London," Trump said last month, before adding that now, "We have an embassy in a lousy location."